Experience the adrenaline rush of a lifetime by jumping from the top of a 165 feet tall bungee crane on the island of Koh Samui. The adventure begins as you're picked up from your hotel and taken to the jump site. Here, with nervous excitement, you'll suit up with the safety harness and enter a lift that'll take you to the top of the crane. Take in gorgeous views of the wider Chaweng Lake, feel your heart beating in anticipation, count to three and jump. For the first few seconds of the jump, you'll fly in a freefall until the cord on your safety harness stretches and pulls you back up. If you request a wet jump, you'll touch the water in the swimming pool just below the crane before the cord pulls you back up. 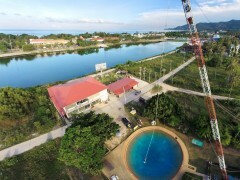 The jump site at Koh Samui is flanked by the Chaweng Lake on both sides. 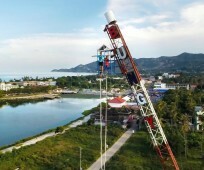 From the top of the 165 feet tall bungee crane, you'll get amazing views of the Chaweng Lake around you, the Gulf of Thailand on the horizon as well as the island of Koh Samui below you. The jump site is also equipped for a wet bungee jump, during which you'll take a dip in the swimming pool under the bungee crane before being propelled back up by the attached cords. • Jump from a height of 165 feet at the Koh Samui bungee jump. • Do a wet bungee jump in the swimming pool. • Get sweeping views of Koh Samui from the top of the crane. Travellers are required to weigh a minimum of 40 kgs and a maximum of 110 kgs in order to book this bungee jump in Koh Samui. Travellers are required to follow instructions of the adventure guide during the bungee jump in Koh Samui. For cancellations made before the scheduled pick-up for Koh Samui bungee jump: 100% refund. For cancellations made after the scheduled pick-up for Koh Samui bungee jump: no refund. All refunds will be processed after deducting international payment transfer fees. Please check with us what these charges will be for the Koh Samui bungee jump. Hotel pick-up and drop-off is included in this package, only if your hotel is located in Chaweng, Choeng Mon, Lamai, Bophut or Maenam Bangrak. Accordingly, please inform the tour operator regarding the address of your hotel to facilitate the pick-up. The jump site opens at 10:00 hrs and closes at 18:00 hrs. Please arrange to arrive the jump site accordingly. You can select between a dry bungee jump or a water dip bungee jump in the swimming pool at the jump site. There is no drop-off for the Koh Samui bungee jump. Go bungee jumping in Koh Samui! If you're staying at a hotel in northern Koh Samui, you can be picked up in a private vehicle. Once you arrive at the jump site, you'll speak to an adventure guide who will explain the entire jump process. When you're ready to jump, the guide will secure you with all the necessary harness and safety belts. With nervous excitement, you'll get inside a lift that will take you to the top of the crane. From here, you'll count to three and take the plunge, flying down 165 vertical feet in a few seconds. After the jump, you can relax at the jump site. Your trip ends here. Prepare for the jump of a lifetime from 165 feet above ground. Personal expenses like apparel, meals or beverages etc. The tour operator will arrange for a pick-up from your hotel in Chaweng, Choeng Mon, Lamai, Bophut or Maenam Bangrak in Koh Samui. You can reach Koh Samui via flights to the Samui International Airport. The jump site is located near the Chaweng Beach, 5-km/15-min drive from the Samui International Airport.